Railway Recruitment Board has issued the official notification regarding the RRB JE, CMA Recruitment 2019 for 13487 posts of various profiles. The vacant posts are for the RRB JE, CMA Examination 2019. The department planned to conduct the examination in the month of April/ May 2019. Many candidates have been noticed to apply for the RRB Recruitment. Now, the department is about to be issued the RRB CMA, JE & DMS Admit Card 2019. The only authentic applicants have been selected and allowed to attend the examination. The desired candidates have been invited to appear in the RRB JE, CMA Examination 2019. Now, the Department is going to organize the RRB JE, CMA Examination 2019 in the month of April/May 2019. Candidates who have made a national application must attend RRB JE, CMA Examination 2019 in this written examination. For this, they have to carry their call letter with them. They will be able to download the admit card soon. 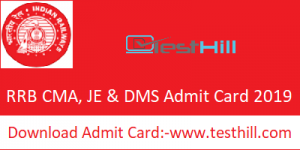 Admit card is available on the official website i.e. www.indianrailways.gov.in. Candidates need to provide some mandated information to download their admit cards.